AFC Rushden & Diamonds return to FA Cup action this weekend with their season well and truly up and running. 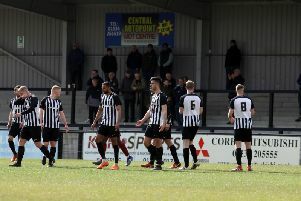 Having suffered two defeats in a row to kick-off the new Evo-Stik Northern Premier League Division One South season, an unconvincing 4-3 success over United Counties League side Sileby Rangers in the preliminary round of the FA Cup proved to be the spark they needed. Diamonds followed that up over the bank holiday weekend with back-to-back league wins as they ran out 3-1 victors at Carlton Town before defeating Bedworth United 2-0 at the Dog & Duck on Monday afternoon. They are now back in FA Cup mode as they prepare to entertain Ryman League North Division outfit AFC Hornchurch in the first qualifying round tomorrow (Saturday). Having reached the fourth qualifying round, where they were beaten in a replay with Northern Premier League Premier Division side Barwell, last season, Peaks is keen for more success in the competition. “We have given ourselves a good foundation to build on in the last three games,” Peaks said. “Now we have to refocus and be ready for the FA Cup on Saturday. “We know it’s going to be another tough game but we will train tonight (Thursday) and ensure we are in good shape. “The game with Sileby was always going to be a bit of a banana skin with them being from a division lower but we got through it. “We had a great run in the competition last season and we want to try to do that again if we can. “We have done a bit of homework on Hornchurch. I have had some reports on them and they will come here and make it hard for us. “But I am more interested in what we do. In the past couple of games we have shown what we are capable of. Peaks is confident midfielder Ross Oulton will be fit for Saturday’s clash after he was withdrawn during Monday’s success. But Jake Newman and Joe Curtis are unlikely to be involved, although they are making progress in their recoveries from injury. “Jake and Joe aren’t far away but it will more than likely be another couple of weeks before we see them,” Peaks added. “But I am fairly happy with the squad. I was able to change things around on Monday, which was good with us having two games in a short space of time.